Instructions relating to bunching of stages while fixing the pay in 7th CPC was issued vide Board’s letter dated 26.09.2016. Subsequently in View of interim clarifications issued by Ministry of Finance (Department of Expenditure) vide their OM No. 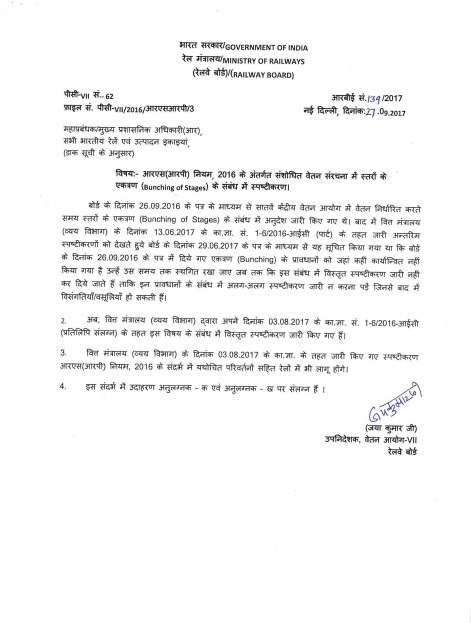 1-6/2016-IC (Pt) dated 13.06.2017, it was advised vide Board’s letter dated 29.06.2017 that, wherever not given effect to implementation of provision of bunching contained in Board’s letter dated 26.09.2016 may be put on hold till such time detailed clarifications are issued to avoid subjective interpretation of the provisions that could result in anomalies/recoveries at a later date. Illustration to show where bunching to be provided in the case of Doctors who draw Non Practising allowance. The bunching benefit needs to be provided to A as it fulfils the conditions under MoF’s OM. If nothing is going to be given why all this please.